Give a little magic away this Christmas with the delectable Tupperware Brands Chocolicious X’mas Gift Set that packs an array of delightful chocolates from Ritter Sport in a Tupperware container. This gift is perfect, whether you’re a Tupperware-holic or a Chocoholic, so go on and share some holiday cheer with friends, family, clients or colleagues. 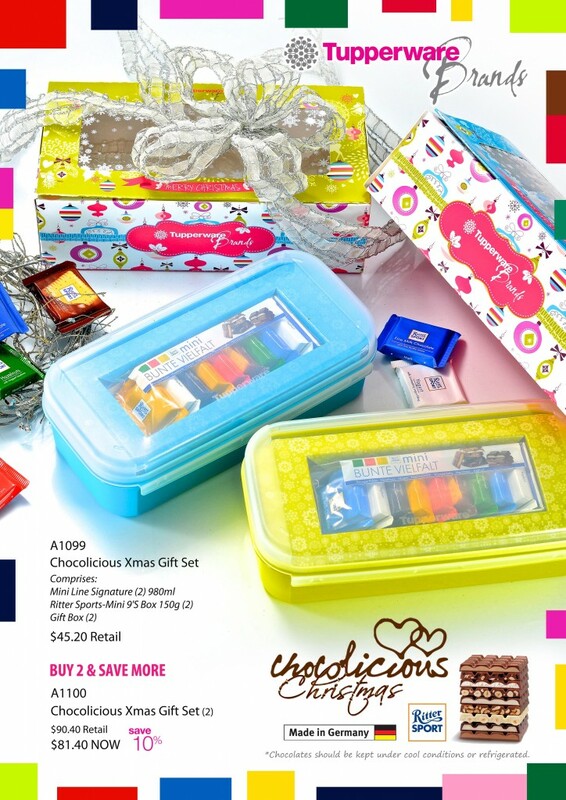 The Set comes with two Tupperware containers in yellow and blue, which are filled with exclusive chocolates from Germany, beautifully adorned for the Christmas season and all ready for giving. More importantly, in this season of love, as we share with our dearest and nearest, let’s not forget about caring for the earth as well. Wrapped in an eco-friendly box that features a fun photo frame, the box is reusable and can be put to good use in multiple creative ways, from storing personal items, to keeping things organized as a compartment box, or even as gift box. Coupled with a reusable Tupperware® container, this is a gift where nothing goes to waste, making it a thoughtful Christmas gift for anyone! The Set is exclusively available from 17th Nov – 31st Dec 2014, only while stocks last! 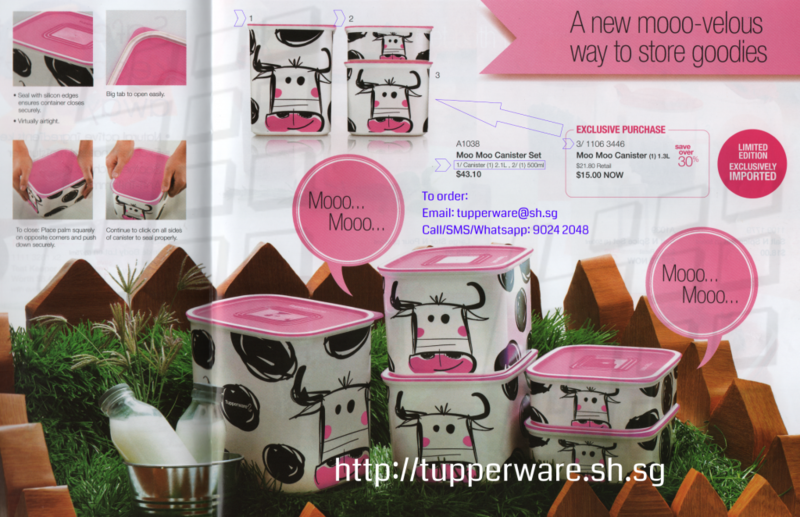 Tupperware Singapore November 2014 Catalogue is out now! Please click the button below for the November 2014 catalogue! Tupperware Limited Edition Moo Moo Canister! Cute! Argh! Since when did Tupperware come out with such a cute design?! Tupperware has imported this special cow Moo Moo Canister from overseas and is a limited edition! Click on the picture for more detail on the pricing. Please quickly place your order with me as I foresee that the stock will run out very fast for this. SOLD OUT! Sorry folks, all the stock I managed to acquire has been sold out! There’s no more stock at Tupperware’s Warehouse since 7 November 2014 and we understand that there will be no replenishment of stocks due to this being a limited release!